O'Donnellan & Joyce is offering for sale a three bed semidetached residence at Lurgan Park, Renmore, Galway. This popular and sought after development on the east side of Galway city has long being considered a premier residential family estate. 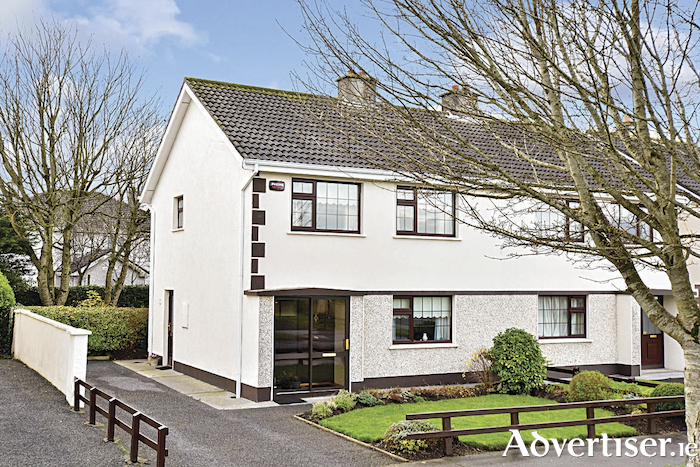 The property is superbly positioned within minutes of GMIT and a number of national and secondary schools. Merlin Park Hospital, the Galway Clinic, and Bon Secours Hospital are all nearby, as are a number of medical device companies such as Boston Scientific, Merit Medical, and Creganna. Renmore is well positioned for all those seeking ease of access to Galway city centre and is serviced by an excellent road and bus network. No 203 Lurgan Park is an exceptional family home presented in pristine condition with careful attention to detail and decor throughout. The accommodation includes an entrance hall, lounge with feature marble fireplace, a separate dining room, and a kitchen/breakfast room. Upstairs the accommodation comprises the main family bathroom and three bedrooms, two doubles and one single room. Outside the property overlooks a large green area to the front and offers a tarmacadam drive with a wide side entrance and ample off street parking. The property has a front garden and a substantial south facing manicured rear garden with mature planting and patio. The property is bright and spacious and would be an ideal owner occupier residence or gilt edged investment due to its favourable position close to a host of amenities and services. The Galway to Dublin M6 motorway is also close to the property providing quick links to the M17 and M18 motorways with access to many of Ireland's largest cities, towns, and villages. Viewing is highly recommended and guaranteed not to disappoint. The BER is D1. Asking price is €275,000.